The University of Virginia’s Darden School of Business could expand into two upper floors of a Rosslyn office building. 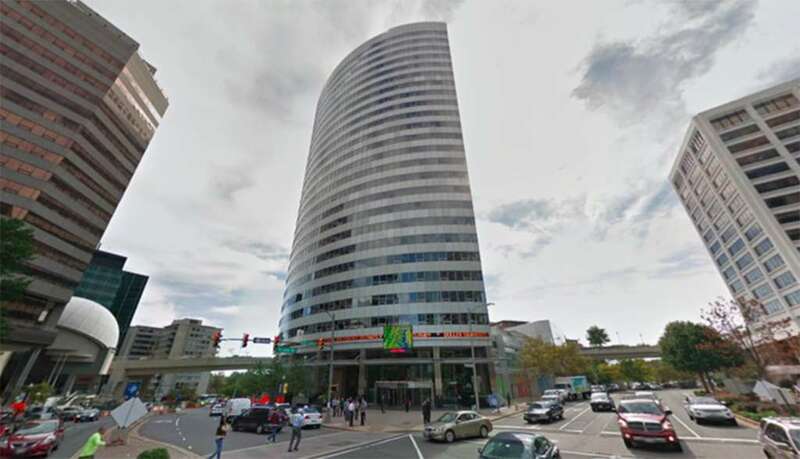 Under plans before the Arlington County Board for its Saturday (September 16) meeting, building owner Monday Properties wants to convert existing office space at 1100 Wilson Blvd on the 30th and 31st floors to educational use. Just over 39,000 square feet of space would be converted. “The renovated space will feature classrooms, multi-purpose spaces and supporting office space,” a staff report on the project reads. The report recommends the Board adopt the plans. Per the application, the 30th floor would get three classrooms, a boardroom, a multi-purpose room, space for catering, conference rooms and break-out areas. The 31st floor would host two tiered classrooms — with auditorium-style seating for lectures, large discussions and the like — as well as a flat classroom and 12 case rooms for small meetings. The report notes that the Darden School is the “anticipated tenant,” and that classes will be held at the site during off-peak hours and weekends to reduce strain on the building’s parking. The school already hosts regional staff offices in the building, and provides executive MBA classes at 1000 Wilson Blvd and 1919 N. Lynn Street. It expanded into the D.C. area last year. County staff said the nearby Radnor/Fort Myer Heights Civic Association president did not raise any objections to the plan, while the North Rosslyn Civic Association did not send any comments before the staff report was published. Staff from the Rosslyn Business Improvement District wrote in support of the proposal. Disclosure: Monday Properties is an ARLnow.com advertiser. Photo via Google Maps. Ask Eli: Does A Pool Help Or Hurt When Selling?